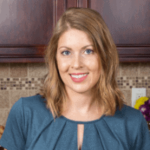 Published: Sep 24, 2018 · Modified: Apr 11, 2019 · By Jen Sobjack · This post may contain affiliate links. 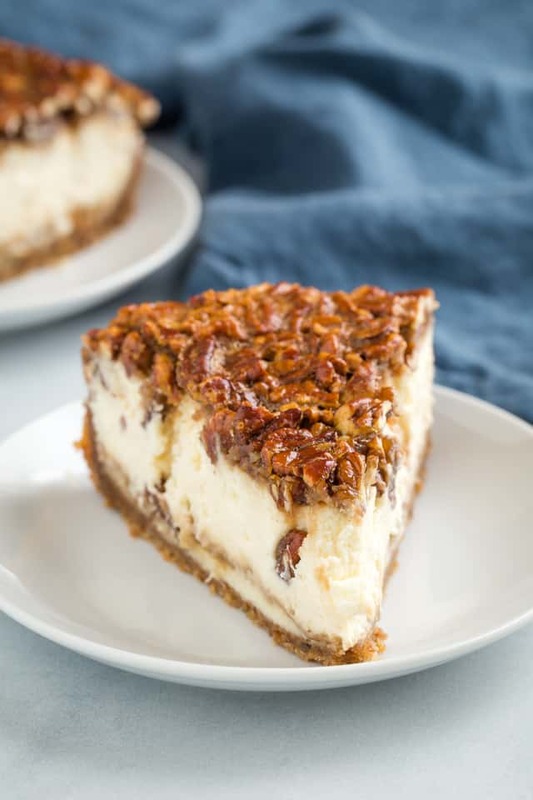 Pecan Pie Cheesecake with real pecan pie filling on top of a creamy cheesecake base. Fall is officially upon us and I can think of no better way to celebrate than with pecan pie! 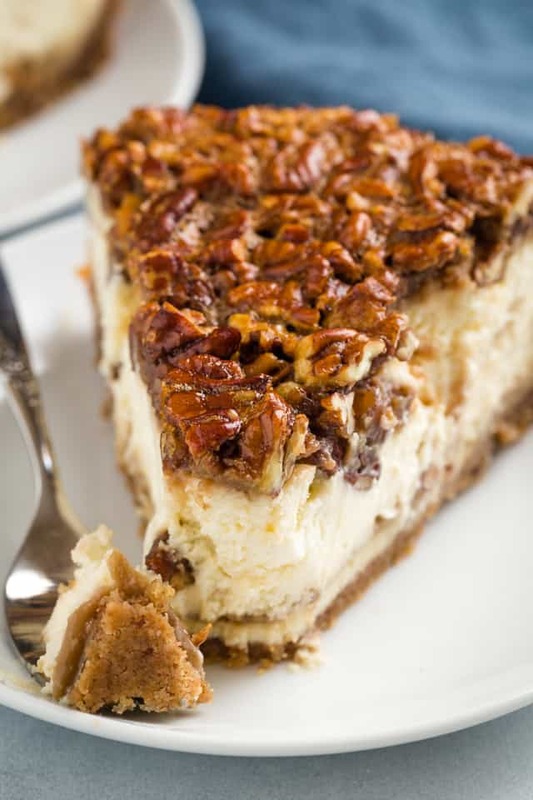 But not just any pecan pie, I’m talking about a pecan pie cheesecake. A rich creamy cheesecake topped with real pecan pie filling. Sounds incredible, doesn’t it? This recipe is a fun way to take two well-loved classics and combine them into one. It tastes so good, you’ll want to make it all season long. Don’t let this recipe scare you. I know there are quite a few ingredients and the steps to making the cheesecake look overwhelming but it’s really not that complicated. Can pecan pie cheesecake be frozen? Yes, it certainly can. After it has set in the refrigerator, remove the springform pan and wrap the cheesecake tightly with plastic wrap and a layer of aluminum foil. It can be frozen for up to 2 months. Thaw the frozen cheesecake overnight in the refrigerator. 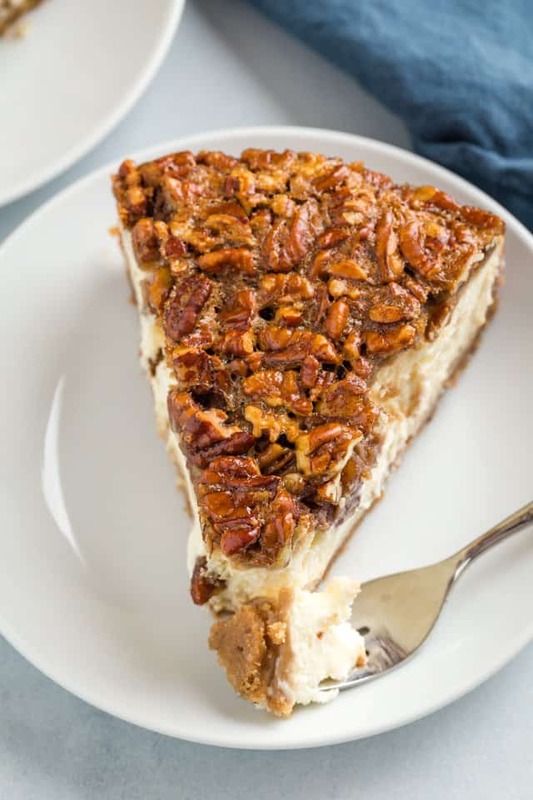 How to make pecan pie cheesecake? The batter for this recipe is very similar to my basic cheesecake recipe. I scaled it back some so there would be room for the pecan pie filling on top. Pour the cheesecake filling over a graham cracker crust and bake it for 30 minutes. The cheesecake will be just set enough to hold the filling without collapsing. Typically, I’d recommend using a water bath for cheesecakes but it’s really not necessary for this one since we are topping it with pecan pie filling. Start on this step while the cheesecake is baking! I researched my heart out to find the best pecan pie filling for today’s cheesecake. I ended up using a recipe from Joy of Baking. The filling calls for rum but you could bourbon also. Or if you don’t want to use alcohol, you can mix in vanilla extract instead. The topping is a bit runny and may leak down to the bottom of the pan during baking. This happened to me and “glued” my springform together. This made it very difficult to remove the sides from the pan. I tried lining my pan with foil but that didn’t work either because the foil stuck to the crust. I’m saying all this to let you know the cheesecake is a PAIN in the rear to remove from the pan! But don’t let that stop you from making it. It is delicious and just requires a little patience when loosening the springform. Pour the pecan pie filling over the cheesecake and immediately put it back in the oven. Bake it for another 40-50 minutes. The top should look golden brown and crisp. Pecan pie cheesecake does need to be refrigerated for at least 4 hours before serving but it’s better if you let it chill overnight. When you go to slice it, use a sharp knife and run it under hot water to warm the blade. Carefully wipe the water off the blade then make a cut in the cheesecake. Repeat this step with each cut and your slices should come out perfect. As with all cheesecakes, this one needs time for preparation and refrigeration. Plan accordingly. No water bath is needed for this recipe. The cheesecake will remain creamy and any cracks that may form will be covered with the topping. Bake this cheesecake on the middle rack. 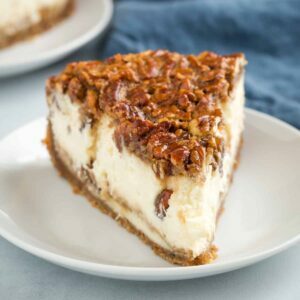 Pecan Pie Cheesecake with real pecan pie filling on top of a creamy cheesecake base that’s nestled in a graham cracker crust. Move the oven rack to the middle position and heat the oven to 350°F. Line a 9-inch springform pan with foil and spray lightly with nonstick spray; set aside. Combine the graham cracker crumbs, ground pecans, sugar, and melted butter. Press the crumb mixture into the bottom and about 2-inches up the sides of the prepared pan. In a large mixing bowl beat the cream cheese with an electric mixer until smooth and creamy, about 1 minute. Add the sugar and sour cream, beat until well combined. Add the vanilla, beat on low speed until smooth. Using a silicone spatula, gently stir in the eggs just until combined. Pour the batter over the prepared crust. Bake for 30 minutes. Once the cheesecake goes into the oven, begin working on the topping. Combine the dark brown sugar, corn syrup, rum, and butter in a medium saucepan. Cook over medium heat until it reaches a boil, stirring constantly. Remove from heat and let cool while the cheesecake is baking. Meanwhile, whisk the eggs, salt, and cream together; set aside. Once the cheesecake has baked for 30 minutes, remove it from the oven. Slowly whisk the egg mixture with the cooled sugar syrup until well combined. Stir in the chopped pecans and pour over the top of the cheesecake. Transfer to a wire rack and cool completely. Cover the cheesecake and refrigerate for at least 4 hours before serving. Pecan pie cheesecake will keep for up to 2 months covered tightly and stored in the freezer. Thaw overnight in the refrigerator. *Rum or Bourbon can be used. If you don’t want to add the alcohol, you can use pure vanilla extract in its place. Pecan pie topping from Joy of Baking. Method adapted by Jo Cooks. Unfortunately this was somewhat of a disaster. The pecan topping was too heavy for the cheesecake. Maybe if it had cooked for longer than 30 minutes – maybe another 15? – before putting the topping on, but it just sunk through with the batter coming up around the pecan topping. Instead of just saying 30 minutes – giving some additional advice on what the texture or consistency should be may help since ovens vary in cooking time. The good news is that the flavor was very good, but from a visual perspective could have been better. I’ll be making a video for this recipe soon! The cheesecake isn’t meant to be cooked all the way after 30 minutes but it should be able to support the filling which then gets cooked for an additional 40-50 minutes. I’ll update the recipe with additional notes once I get the video ready. Followed instructions exactly. Just pulled the cheesecake out and gentled spooned the topping over the top after 30 minutes of baking and it went right through the center. I have no idea how I’m going to fix this… On Thanksgiving no less. Sigh. Guess I’ll toss it back in and add the rest of the pecan topping the last few minutes. Suggested tweak: wait 45 minutes before adding the topping. Hi! Amazing recipe: do you think an Oreo crust would go well with this? 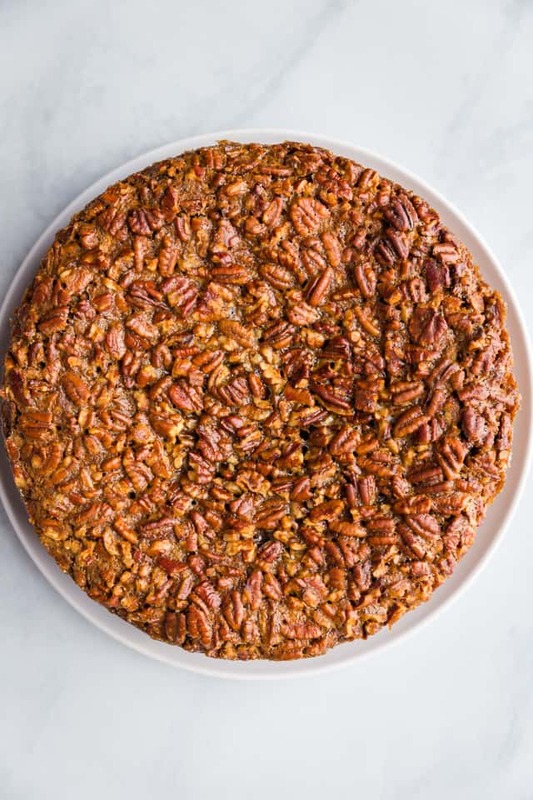 I am conflicted between making and taking this cake to a potluck for thanksgiving or your butterfinger CK recipe; thinking of combining the best of both worlds, but at the same time, wasn’t sure! I haven’t tried it with an Oreo crust so I’m too sure how it will taste. I’d go with making the Butterfinger cheesecake. I followed the directions exactly and when I poured the corn syrup mixture over the cheesecake it all sunk in the middle . I have oven thermometers so I know my oven was working properly and I used a timer. I’m really sad because I’m making it for thanksgiving and it’s not pretty and all of the mixture is in the middle. Pecans are NOT cheap and I wasted about $30 on ingredients for this recipe. I’m not even sure if it will cook properly now. I just put the cheesecake in the oven for the last round after pouring the pecan topping on after letting the cheesecake bake for 30 minutes. The cheesecake broke open in the center while pouring the pecan mixture on top. I am hoping it will taste okay and okay too. Do you think it will be okay? I am making it for Thanksgiving dinner with the family, we are all making something and I was asked to make the dessert. I normally make really great cheesecakes but I have never made something that had a step pulling it out after 30 minutes and then doing the topping. Hmmm, I haven’t had that happen. It does go back into the oven after adding the pecan pie filling so it will continue to bake and set. This morning I cut into the cheesecake and all most of the peacan dropped into the center of the cake. So next time, can I bake it an extra 10 minutes? You could probably bake it for an additional 10 minutes before adding the topping. I am a huge fan of creamy cheesecakes and every one of my cheesecake recipes reflect that. This is why I chose to only bake for 30 minutes before adding the topping. After the topping goes on, it bakes for another 40-50 minutes. My fear is the texture of the cheesecake will change if it’s baked any longer. I plan to make it again soon and I’ll update the recipe with any additional notes on the baking process. Same thing happened to me, hopefully it still turns out good. Yes the same exact thing just happened to me. I’m just waiting to see how mine turn out too. Glucose instead of corn syrup? Or what can I substitute corn syrup for? Hi Ana! I’ve never used glucose before and I’ve only made pecan pie filling with corn syrup but the corn syrup is just to help keep the filling smooth instead of grainy. I imagine glucose would work okay for this. Super delish! I cut parchment paper to line the bottom and sides of the pan before I added the ingredients. That helped keep the sticky toping from gluing the cake to the pan. Getting it out of the pan was a breeze! I’m so happy to hear you had success with the recipe! Pecan pie cheesecake is something I can’t be trusted around!